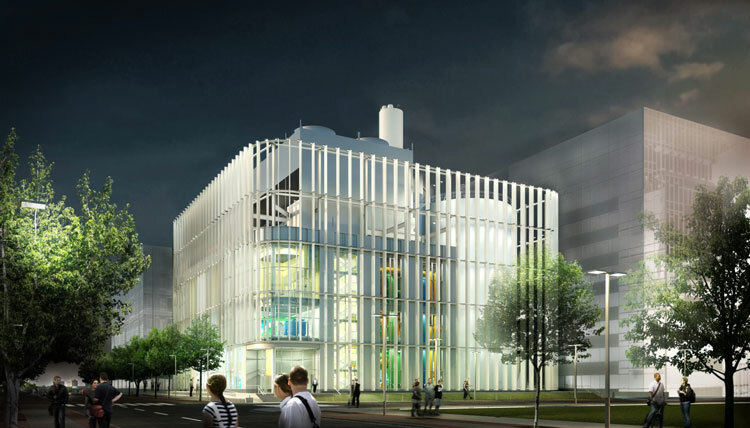 Boston — Leers Weinzapfel Associates’ 58,000-square-foot Harvard University Allston Campus District Energy Facility (DEF) is now under construction. The project represents a new, highly efficient infrastructure typology — the cogeneration plant — that will provide electricity and hot water as well as chilled water to the campus. Located at a prominent and highly visible site, the DEF sets the Allston campus standard for flexible and innovative quality and design, a visible demonstration of cost-effective sustainability in building, landscape, and site development. Its compact cubic form with rounded corners allows for maximum flexibility of future development around it while maintaining a singular bold and refined presence. Developed with RMF Engineering, the DEF’s equipment systems are the most efficient and resilient available and are adaptable to the campus’s future needs. Equipment elevated above flood levels supports resiliency for continuous independent operation of the facility, even in the event of electrical grid failure. Additionally, a chilled water reserve tank provides thermal energy, supporting efficient equipment use. A wrapper of metal fins forms a screen around the building, with petal-like elements set at varying degrees of openness to reveal or conceal the various equipment areas within. The fins are most open at the structure’s corner entry and the round thermal energy storage tank, and most closed on its service sides. On the public face of the building, the fins are raised above the ground to reveal the main equipment hall to passersby. The DEF’s transparent interior invites the user community — and the community at large — to observe the cogeneration plant’s complicated system of chillers, boilers, piping, pumps and flues, and electrical rooms, making it a teaching tool for the university’s new science and engineering campus.